The red spray paint appeared one late October morning at the site of a future state park in Los Angeles. Sloppily written slogans, including "Trump rulez,” “Hail the Aryans” and other messages encouraging violence against Jews and blacks covered a couple port-a-potties and benches. Known as the Bowtie, the 18-acre open lot is frequently host to the colorful work of LA graffiti artists, because police rarely venture there and the city doesn't bother to destroy the work. But the new graffiti was different: It was a disturbing visual reminder of the current rise in hate speech and crimes throughout the state. California has been known for hate activity since the Chinese Exclusion Act of 1882 opened the gates to coordinated attacks against Chinese immigrants in Los Angeles. These days, it has the highest number of active groups in the country — 79, with nearly half of them based in or around Los Angeles, according to the Southern Poverty Law Center’s Hate Map. The SPLC began to keep a tally in 1999, when demographic projections noted that the growing Latino and Asian population was expected to challenge whites’ nationwide majority status by the middle of the 21st century. In California, that demographic prediction is already nearly a reality. With it has come a rise in hate crimes: According to the latest annual report by the California Department of Justice, there was an 11.2 percent rise last year in crimes committed against people based on their race or ethnicity, with attacks against African-Americans coming in first and Latinos second. Faced with those numbers, Timothy Zaal told me over the phone that he's been “feeling overwhelmed.” At 6-foot-3, he remains intimidating, with his strong build and shaved head, even at the age of 52. Zaal is a former skinhead, and though he hasn’t been active in three decades, the old feelings rise again whenever he sees footage of racist attacks like the ones he used to commit. “I would compare it to relapsing as a drug addict, or to going into a bar when you’re an alcoholic,” he said. In the past year, such attacks have been in the news, most notably the one committed last summer by white nationalists and neo-Nazis in Charlottesville, Virginia. Zaal has to remind himself that the adrenaline rush he still feels is “a lie, because I know I’ve been conditioned and indoctrinated,” he said. 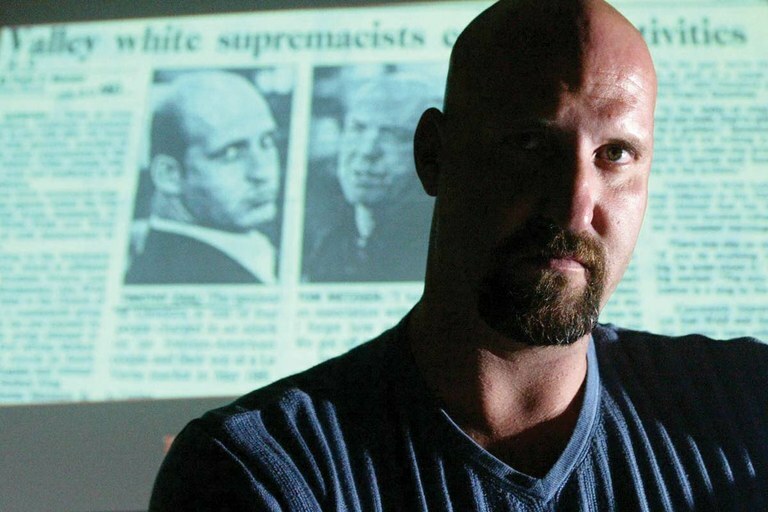 Former neo-Nazi Timothy Zaal poses in front of a newspaper article about his past involvement in hate crimes, part of his presentation about his personal experience as a skinhead, at the Simon Wiesenthal Center’s Museum of Tolerance in Los Angeles, California. There, he gives a talks about his personal experiences with white supremacist hate groups. As a teenager growing in a working-class suburb of Los Angeles, Zaal sought out neo-Nazis. It started when his parents, feeling outnumbered by their new Latino neighbors, decided to move out of his childhood home. Around that time, a black gang member shot Zaal’s older brother, whom he looked up to, on the street. Zaal’s anger and grief acted on him like a call to arms and became his way of making sense through perpetuating the violence. Before long, Zaal reached out to the national leader of White Aryan Resistance (founded by former Ku Klux Klan Grand Dragon Tom Metzger), who put him in touch with a local chapter. Zaal wasn’t interested in proselytizing. He was the “boots on the ground,” the guy known among his peers for brutally beating a young homeless gay teen in the streets of Hollywood in 1981, leaving him for dead. In 1990, Zaal was sentenced to one year in jail for his involvement in an attack on an Iranian couple. State hate crime laws were lax back then; today, Zaal would likely face a much lengthier sentence. A proposed bill, if passed, would further expand those laws by punishing similar crimes committed by white supremacists as acts of terrorism. Southern California's racial and ethnic diversity only aggravated Zaal’s racism. “We’d say, ‘Multiculturalism is taking over, we have these illegal, undocumented people coming into the country, and we’re being outbred.’ ” Similar rhetoric is galvanizing much of the alt-right today, but the landscape is much more fractured, though thriving online. It’s not just skinheads, neo-Nazis and white nationalists; there are also Holocaust deniers, neo-Confederates, and anti-LGBT, anti-immigrant and anti-Muslim groups. Many of these groups piggybacked on Donald Trump’s rise to power to bring their ideology into the mainstream. Not all these groups are as violent in real life as they appear online. But that is no consolation to Zaal, who recognizes the psychological impact of hateful speech and now dedicates himself to helping “formers” change, just as he did. It can take months or even years to help reform a neo-Nazi, and even then, the shame of having belonged to a hate group lingers. Or rather, it comes back to haunt you every time you see yourself reflected in the day’s news, or in the graffiti scrawled on a port-a-potty.